In many parts of the country, it’s easy to tell that spring has sprung. 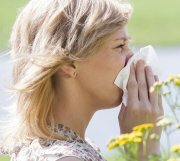 Outdoor surfaces are covered in pollen, leading many to cough, wheeze, sniffle and sneeze. Yes, spring allergy season is upon us. Pollen is a fine dust or powder released by plants to help with germination. Unfortunately, pollen is also the number one allergy trigger in the United States. The most common reactions are congestion, sinus pressure and runny nose. Pollen allergies are commonly called Hay Fever. So, what can you do to help get a better night’s sleep if you have pollen allergies? Avoid the allergen. This is good advice for any allergen, but you can’t just stop breathing and it’s tough to avoid going outside altogether, so how do you avoid pollen?. The solution, at least at night, may be to keep your house closed during the worst time of year for pollen (spring), and get an air purifier for your bedroom so at least one room is reasonably free of pollen. A more expensive solution is a heating and cooling system that includes HEPA air filtration. Beware of machines that emit ozone, however, as it can irritate your nose and airways. Bathe your outdoor pet. If your dog or cat spends the day outside, pollen could get trapped in his or her coat. If your pet then crawls into your bed, that pollen comes along for the ride. While it may be time-consuming, a nightly bath will eliminate this problem. Bathe yourself. Your hair can trap pollen much like your pet’s hair. If you spend time outdoors during pollen season, wash your hair before getting into bed. Bathe your sinuses. One of the most popular home remedies for congestion are “neti pots” and other sinus rinses. These rinses, which flush your sinuses with a salt water solution, can provide temporary relief for pollen allergy symptoms. The water washes out the mucus, while the salt solution helps dry out what’s left behind. Treat the problem. Fortunately modern science has provided a number of medicines, both prescription and over-the-counter, that will help ease symptoms of pollen allergies. See an allergist to be tested, and find out exactly what is triggering your allergic response. The allergist will then recommend a treatment. For more allergy sleep advice, use our search bar to search for “allergies”.